Carl and Richard put together a great podcast. .NET Rocks! has existed for years now and it’s amazing how many episodes they’ve published. A couple of weeks ago, I had the privilege of recording their latest episode with them, #1041. We talked about a ton of interesting things like the importance of memory management, precise measurement, using the correct tools, not being afraid of the debugger, a little bit about Microsoft culture, and even LEGO! 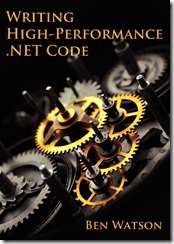 Carl and Richard talk to Ben Watson about his work around writing high performance .NET code. Ben talks about how the Bing team decided to use .NET code internally, which seems like an obvious choice for a Microsoft group, but it isn’t really – when milliseconds count, does .NET makes sense? Ben says it does, and he’s done the work to prove it. Ben’s book “Writing High Performance .NET Code” focuses not only on coding techniques, but also the larger practice of having a deep understanding of how .NET works, and the processes that take place to turn .NET code into machine code. The conversation also digs deeply into the need for performance measurement, especially Event Tracing for Windows. .NET can be fast when you do it right! Give a listen. Subscribe in iTunes or listen on the web. Let me know what you think! This entry was posted in .NET, Link/News, Software Development and tagged .net, book, interview, performance, podcast on September 29, 2014 by Ben.